f. g. Q7. Describe the first aid that should be given to a victim suspected of having a sprained or strained leg. RESCUE PROCEDURES Learning Objective: When you finish this chapter, you will be able to Recall the procedures to rescue a person. There are many ways to move victims. The method used depends on several factorswhere the victim is located and where the victim is to be taken, assistance available, equipment on hand, and so forth. If available, litters or stretchers should be used. In you dont have any help, there are several methods you can use to move a victim alone. One method is simply to pick up and carry the victim in your arms, but it can be quite a task if the victim weighs more than you. If a blanket is handy, the victim can be placed upon it and dragged. Two other means are the firemans carry (fig. 14-19) and the tied-hands crawl (fig. 14-20). FIREMANS CARRY One of the easiest ways to carry an unconscious person is by the firemans lift, also called the firemans carry (fig. 14-19). 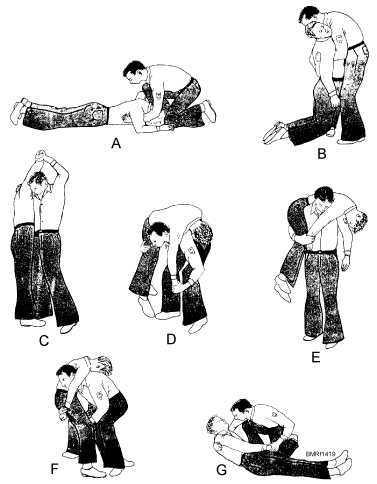 14-25 Student Notes: Figure 14-19.Firemans carry.